It rains here in Portland. It rains a lot. And the dog park gets nasty and wet and muddy. Last spring we tried every one we could find and there was always lots of mud. Mom wouldn’t let me drink it–she said it was icky and would make me sick. But I did anyway! Then I would have to go home. Sometimes I still was rarin’ to go! I have lots of energy–Mom is always saying she wished she could bottle it and sell it. We’d be RICH!! And let me tell you, just taking me for a walk is NOTHING. I have to run and wrestle–that’s because all that energy has to go somewhere. And my hyper-switch is still there!! Yep, it is. So, Mom went on a quest and guess what she found? FIDO’s!! 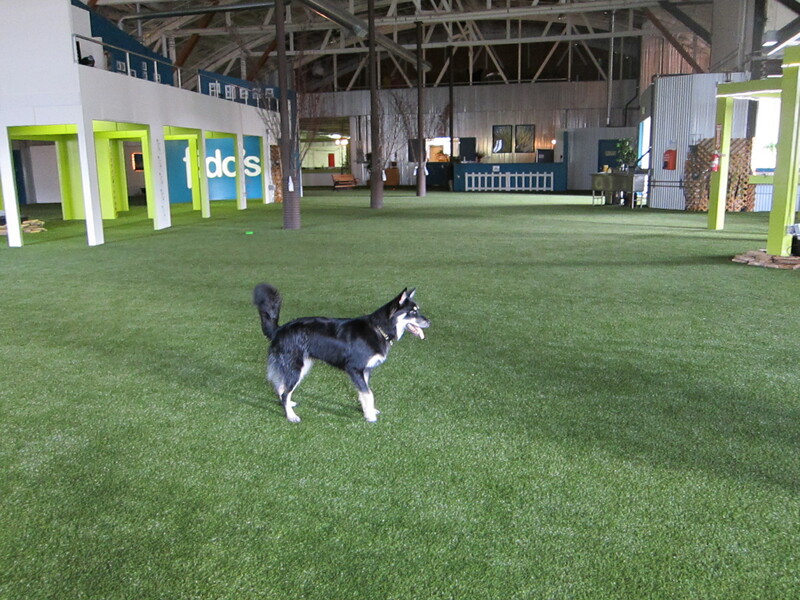 That’s a new indoor dog park–here in Portland. And it’s not far away! WOW, this is great! Toby and I love it. And all the humans are so nice! They even let me play in their water bowls. Well, what did they expect? They were just my size–I can get in and curl up! They even have a big swimming pool! It’s HUGE. I haven’t been in it yet, but I will. You know how much I love water!! And you can stay there all night or you can stay there during the day without your Mom or Dad. I’ve never done that before–I wonder what it’s like? There are a bunch of dogs that do and they are always lounging around on the sofas and getting treats. I love the grass area. I wanted to show you how big it is. And I had it all to myself, but a bunch of dogs came later. We got to run and wrestle! I LOVE Fido’s!!! 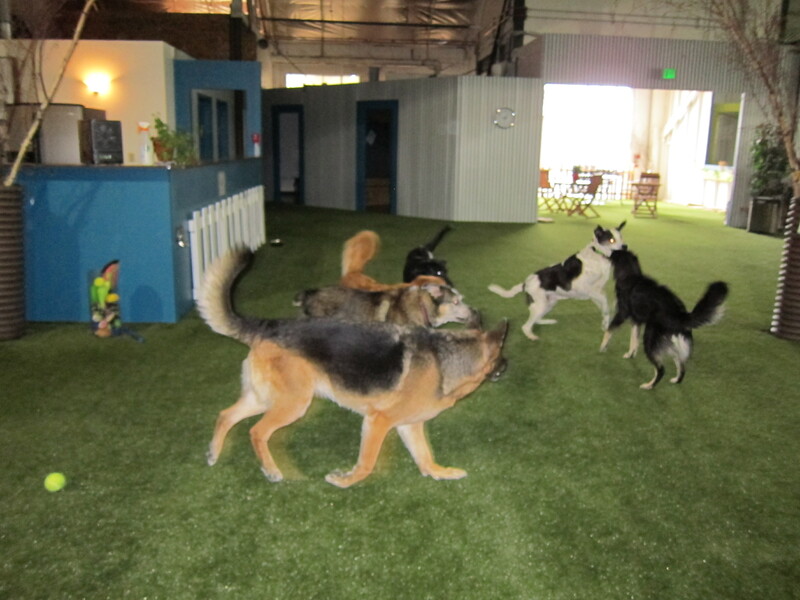 This entry was posted in Dogs and tagged dog, dog park, dog pool, fido's, indoor dog park, Portland, Portland Oregon by Sage. Bookmark the permalink. That is such a great idea, great find fur sure!!! Wow that sounds great Sage. I’ll have my mom see if there’s something like that here. It does rain here sometimes, but I haven’t seen it yet. My mom would love to find a place where she can take me when the weather changes. Oh I is wishing I had sumpin like dis to go to! It wuld be so much fun!!! Yu shuld has fun for me while yu are there! Im yur latest follower from the blog hop! OMD, that is way kewl fur burning off the zoomies! That looks amazing! Wow! I wish we had something like that around here! Thanks so much for stopping by and celebrating Maggie May Day with me!